Everyone and their violent grandma knows what Mortal Kombat is all about: fast paced, incredibly violent fighting gameplay. We've winced in pain countless times at the sight of someone having their heart punched through their chest or getting beaten to death with their own severed leg. OD is the very definition of this blood splattered series. Sure, the game's superstars—Liu Kang, Scorpion, and Sub-Zero—get fanboy love, but some of the more interesting heads get pushed to the back of the line. Where's the love for the other ninjas, vampire starlets and blind samurai? 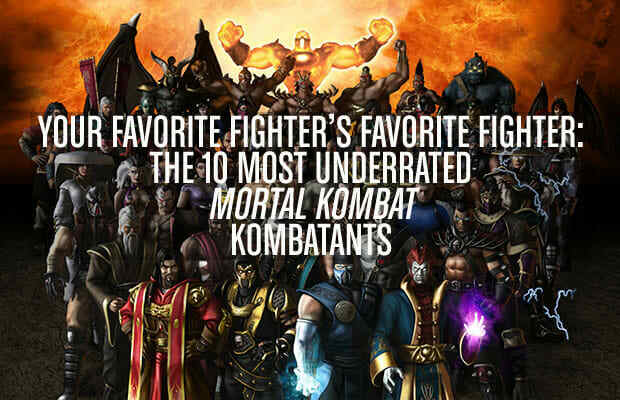 Since we've only got a week until the MK reboot makes heads roll April 19, it's the perfect time to give 'em their just due and run down the 10 most underrated Mortal Kombat fighters. KRAZY! Okay, we'll stop it with the Ks now.